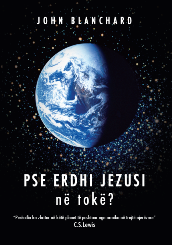 CCL - Alb - Pse erdhi Jezusi n� tok�? =>Edit Form · 01716 » Why on Earth did Jesus come? Kush ishte ky Jezus? A e dim� n� t� v�rtet� se kur ka lindur? A kishte ndonj� q�llim t� ve�ant� p�r lindjen e tij? A ka ndonj� gj� t� ve�ant� rreth tij q� e shquan at� nga gjasht�dhjet� miliard� njer�zit e historis� njer�zore? Si mundet q� ato pak vite q� ai kaloi mbi tok� t� ken� ndonj� lidhje me njer�zit q� jetojn� n� shekullin e 2H�? Pse duhet t� merremi me k�t� pyetje? N� k�t� lib�r t� mrekulluesh�m John Blanchard �jerr mitet dhe 'na e tregon t� v�rtet�n si� �sht�'. Ja cila �sht� historia e v�rtet�, e v�rteta e gjall� q� ka ndryshuar rr�nj�sisht jet� t� panum�rta p�rgjat� shekujve. Lexojeni me kujdes. N�se e kuptoni mesazhin, asnj� Dit� Krisht-lindjeje nuk do t� jet� m� nj�soj si m� par�, as dit�t e tjera. Year after year millions of people pitch into a growing whirl-wind of activity in preparation for just one day - 25 December. Many of those who join in the excitement have at least some idea that this particular date is called Christmas Day because it celebrates the birth of Jesus Christ about 2,000 years ago - yet have no idea why for millions of people worldwide it has become the greatest highlight of the year. It is time to ask some questions. Who was this Jesus? Do we actually know when he was born? Was there a special purpose in his birth? Is there anything that marks him out as being different from the other sixty bil/ion people in human history? How can the few years he spent here have any possible relevance for people living in the 21st century? Why should we bother to find out? In this lively booklet John Blanchard strips away the myths and 'tells it like it is'. Here is the real story, the dynamic truth that over the centuries has revolutionized countless lives. Read it carefully lf you get the message, no Christmas Day will ever be the same for you again - nor will any other day!